Click here to see the main Afterwords page. 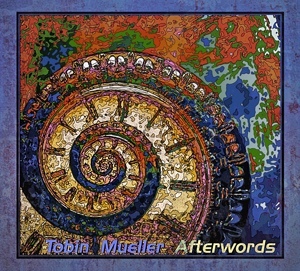 Composer and pianist Tobin Mueller’s newest recording project, Afterwords, offers the listener a very personal odyssey combining the spoken word with original musical mediations, in what the composer, himself, calls “the soundtrack to an intellectual journey.” The 2-CD set features seventeen original piano compositions played by Mueller - each a metaphysical response to a thought or question posed in a literary text. The selection of texts is far-reaching, as are the varied musical styles Mueller chooses to embody his ideas, yet there is a cohesive sense of progression that gives the collection an organic wholeness. Unlike a song in which lyrics and music merge, Mueller’s compositions are conversations – not only between spoken and instrumental, but also between contrasting harmonies and musical themes. There is an overall sense of questing that propels the arc of the work, as the composer grapples with significant existential questions, never completely answering them, but rather inhabiting the space where they dwell. Mueller’s compositional vocabulary and his prowess as a pianist are eloquent and elegant, lively and whimsical, provocative and inspirational by turns. This is another highly original recording project – both demanding and accessible - that will uplift the listener, challenge his philosophical perspectives, and stimulate his aural sensibility. I first became aware of Tobin Mueller and his music in early 2006 when I was asked to review his solo piano debut, Morning Whispers. Afterwords is the seventeenth of his albums I have reviewed and I would have to say that the constants in all of his projects have been change, innovation and artistry. I am always in awe of Tobin’s fearless pursuit of honesty and originality in his work - qualities that seem more and more elusive in these days of dumbing-down the arts to a one-size fits all sameness. It seems that Tobin’s projects over the past few years have become increasingly more personal, revealing more of his inner self than even he might realize. Afterwords may be his most personal project yet, pairing passages from some of his favorite novels, short stories and poems with his original piano solos. The quotations become meditations of a sort and were chosen from a wildly diverse group of authors that includes Ernest Hemingway, Jerzy Kosinski, China Mieville, Walt Whitman, and Dave Eggers. The musical pairings are equally diverse, demonstrating Tobin’s command of a broad range of music genres that weave in and out of the passages he has chosen, illustrating them as only music can while creating an astonishing work of art. Afterwords includes a sixteen-page booklet with all of the spoken word quotations, Mueller’s thoughts about each quote, and many intriguing illustrations. There are nine tracks on Disc 1 and 8 on Disc 2, for a combined total of 84 minutes. The music ranges from jazz to classically-influenced and is sometimes lively and sometimes more meditative. The pieces flow from one to the next to tell a more complete story, but each piece is unique to the quotation that inspired it. It’s a fascinating journey through a collection of writings that influenced Mueller’s work and most likely his life as well. Like the music, the quotations are very diverse - sometimes ironic, sometimes tender and always thought-provoking. Afterwords is a unique project and a singular work of art. Afterwords will definitely be on my list of Favorite Albums for the year! I give it my highest recommendation! An intriguing 2 CD set along with a bonus disc; Tobin Mueller delivers 2+ hours of rich and impressionistic piano, akin to Debussy and Satie, but with a swing and blues feel. On the two cd collection, he intersperses thoughtful verbal meditations, at times poetic, other times narrating from literature, that adds an extra texture to the notes. The concept is intriguing, and fits together well. If you’re simply into the music, the bonus or second disc (with only a smidgeon of prose) may be your thing. The idea works well on its own terms, and is a cozy, personal and intimate treat. Sort of like a musical fortune cookie, with each piece a treasure of encouragement. These are impressive impressions: Vocal and string vibrations of a man in and out of time, by an artist who knows how to coax from his instrument a wide range of emotions. As thoughts and feelings about his own human condition move beyond the boundaries of words, Tobin finds supernal expression in his piano. Both the obvious and the ineffable are expressed in melodic threads, runs and overtones, keystrokes of thought and of melody – pointed, counterpointed, but never disjointed. There are "cool" uptempo jazz idioms in this double album, but one does not have to be a jazz aficionado to breathe them in. It's easy listening, good listening. The spoken intros are nicely voiced-over by Tobin. Well-chosen wordbites from well-regarded literature open the door to each short sonic story. I feel closer to Tobin, having heard his voice in this album. There is frailty (due to his respiratory problems) admixed with openness, honesty and self awareness. What more can I say? Congratulations on this commingling of words and piano, an appealing tapestry of interwoven introspection and extrospection. Bravo! A virtuosic pianist with a vivid imagination, Tobin Mueller's rather fascinating improvisations on Afterwords are melodic but unpredictable, wide-ranging but logical. In the past he has recorded his musical depictions of everything from paintings and current events to areas of the world and holidays. Afterwords features Mueller verbally quoting short passages from some of his favorite literature (including novels, poems and short stories) and then playing his musical impressions of the works and stories. His solo piano covers a wide range of styles and moods as does the literature that he chose to pay tribute to on this double-CD. From Kurt Vonnegut ("Slaughterhouse Five"') and John Steinbeck ("The Grapes Of Wrath") to Ernest Hemingway, Walt Whitman, William Faulkner and Milan Kundera ("The Unbearable Lightness Of Being"), Mueller recites brief excerpts that sum up aspects of the works. The philosophical musings inspire his piano playing. The 17 selections include many highlights. To name a few, "In The Amber Of The Moment" is given a thoughtful and impressionistic interpretation. "The Space Between Chaos And Shape" in its two sections hints at Igor Stravinsky, Keith Emerson and Keith Jarrett. "Stone Water Trough" is boppish and the swinging blues "Every Night A World, Every Morning A Circus" has touches of Oscar Peterson and stride piano while "Longing" is a dramatic and heartbreaking piece that fits its title. Other memorable selections include the melancholy waltz "Violated By Insight," "Dissolution, A Lullaby" which sounds as if it is a classical work from the 1800s, "The Shape Of Love" (a quiet piece about love that lasts forever), and the quietly upbeat title cut. Afterwords is full of superior piano playing and well-chosen passages from the literature. In addition to the full release, seven purely instrumental tracks taken from the project are available as a separate CD titled Afterwords - Solo Piano Bonus Tracks. This is highly personal music that is well worth exploring. For the past 12 years, Tobin Mueller has been exploring the solo-piano format in earnest. Struggling with genetic lung disorder, which was exacerbated by his volunteer work at Ground Zero following 9/11, Mueller says he found solace at the grand piano in his home, which he played each night after dinner for his wife. He’s since recorded several solo-piano albums which showcase his very personal melding of jazz, classical and New Age aesthetics. His latest, Afterwords, features Mueller’s musical interpretations of written text, his compositions inspired by quotations from novels, short stories and poems that have particularly moved him. The pianist, who has a theatrical background, folds into his performance his readings of text from authors such as Kurt Vonnegut, John Steinbeck, Ernest Hemingway and Dave Eggers. Mueller’s inventive melding of styles and sensibilities is well-illustrated on “The Space Between Chaos and Shape”, our selection [for the 2017 disc of innnovative new works included in the December issue], which sources a quote from Jeanette Winterson short story. “In the space between chaos and shape, the was another chance,” Mueller intones, his spoken interlude providing a bridge between an aggressive, propulsive opening section and a hushed, introspective conclusion. This two-CD self-produced set is the first of Mueller's more than twenty-five albums which is accompanied by the spoken word. All are original compositions which the artist performs on solo piano. Some are upbeat and jazzy whereas others are more reflective and suggest more classically oriented compositions. Tobin James Mueller is multi-talented as artist, playwright, composer and pianist. The adventurous listener will be rewarded of the effort. Mr. Mueller sent me this double-CD for review after he’d seen my review of Fred Hersch’s latest CD. He pointed out that, similar to Hersch’s bout with his medical issues, Mueller lives with a hereditary medical condition of which pulmonary aspects have been aggravated by inhalation of smoke and dust from the 9/11 attacks in NYC when he was living in the nearby neighborhood and volunteered to help. The collection includes seventeen original compositions accompanied by Mueller’s brief spoken-over-the-music quotations from various authors whose work inspired him. A separate single CD Afterwords: Solo Piano Bonus Tracks, consisting of seven selections without the spoken quotations is also available. Listening to this mature work may persuade many of us to explore Mueller’s earlier works as well. See www.tobinmueller.com for additional information.